This is massive and for 2nd day Maharashtra is battered. Mumbai was very close to our estimate for Saturday/Sunday cumulative rains...recording an average 0f 230 mms against estimated"around 200 mms"..Santacruz totals 950 mms from 1st June...nearing the all time June total of 1037 mms in 1971. Mahableshwar saw 366 mms in 24 hrs ended Monday morning...more figures coming from Pradeep, our Rainman ! South Chattigarh was informed of heavy rains as Jagdalpur measured 151 mms. Nagpur got 45 mms overnight and another 33 mms on Sunday till 8.30 pm. Indore received 59 mms on Sunday till 8.30 pm. Heavy Rains expected in Vidarbh and adjoining East MP on Monday. Pune too had a wet day with 35 mms in the day on Sunday. AS-2 (Erroneously, Vagaries had numbered this system as AS-1 in last posts. Regret the error) is now deepened , but practically stationary at 19.9N and 67.7E as on Sunday evening. Now having a core estimated pressure at 992 mb, and classified as Well Marked Low by IMD, system will deepen more, to around 988 mb next 24 hrs...South Quadrant winds, supported by Monsoon winds , are strong at around 45-55 knts. Cloud cover is mostly in the West of the system. AS-2 is now having strong ultra moist air is already enveloping it, and no shear resistance, it will track initially NW. 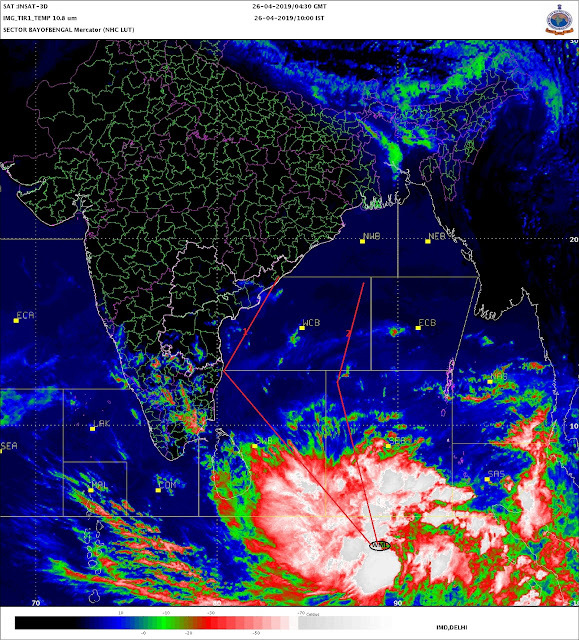 After being stationary for another 12-18 hrs, it will track initially NW, and then after 18-24 hrs move Northwards. Would expect the system to meanwhile deepen to a low of 988 mb, and just weaken before crossing land around the International Border (India/Pakistan). Coastal Sindh and adjoining Kutch can get showers on 23rd/24th , with heavy falls in SE Sindh and Kutch on 24th/25th. Inter action with Northerly trough with the upper axis will also bring showers to rest of Sindh from Monday, possibly increasing on Tuesday and Wednesday as AS-2 moves inland. Hot spots like Larkana and Jacobabad and Upper Sindh will get some relief thunder squalls possibly from Monday night thru Wednesday. Showers expected in Karachi on 24th and 25th. Karachi is extremely Hot at 45c on 19th June, with 20th again touching 44.8c. Minimum 21st was a gruelling 33c !! Read more in Vagaries Pakistan. Turbat in Pakistan was hottest at 48.5c. Mumbai Colaba got 32 mms, Vagaries 33 mms and Santa cruz 49 mms on Sunday in 12 hrs ended 8.30 pm IST. Mumbai City is not going to be directly affected by the system AS-2. As the system tracks, the SW winds will weaken marginally, not strengthen. As on Sunday morning, Vihar Lake received 140 mms, Tulsi 120 mms, and Vaitarna, Tansa and Middle Vaitarna 20 mms each. (Figures are rounded to mms). Surat, will see some showers on Monday with cloudy skies, around 15 -20 mms. Rains marginally increasing on Tuesday night thru Wednesday. The Depression over Bay Of Bengal, off Odisha coast had made landfall between Gopalpur & Puri on 21st morning. It will move further inland and merge with the monsoon axis thereby pushing the onset of monsoon over Chhattisgarh, Madhya Pradesh, Jharkhand and West Bengal in the coming days. The well marked low pressure area over Bay of Bengal, off South Odisha and North Andhra Pradesh coasts has concentrated into a Depression. The System would cross Odisha coast between Gopalpur and Puri on 21st afternoon. Sir, don't forget delhi in your forecast!! Am assuming a spike in temperature by next weekend. First Wide spread Heavy Rain was observed in entire North Konkan yesterday. Abhijitji - actually in normal years coastal KAR places are first to cross 100cm mark for june + hotspots like Augumbe (-600mm) but due to violent surge of north Arabian sea konkan has won race will all stations in excess, madhya MAHA is also moving towards excess - due hyperactive north Arabian sea almost all places of coastal KAR are in severe deficit zone guess only break monsoon can help. When will monsoon reach the northern part of Gujarat? It seems today more than 100-150 places in MAHA received rains > 200mm probably pradeepji can give actual results. Its amazing that monsoon , predicted to be 12% less(by IMD) , is currently 20% excess . Though its just the first month , sets the tone for remaining season. Have we made all time record for June?